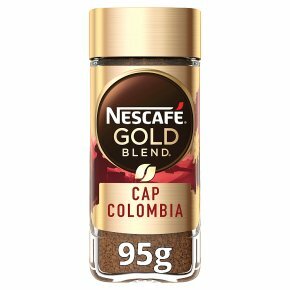 Experience NESCAFÉ GOLD ORIGINS Cap Colombia instant coffee. A premium light-medium roast instant coffee with a delicate intensity. Crafted with 100% roasted Arabica coffee beans from Colombia. A delightfully fruity taste with a fine, citrus aroma. Grown respectfully; sustainably sourced & selected by local farmers.Discover NESCAFÉ GOLD ORIGINS Cap Colombia and immerse your senses in a uniquely rich flavour experience. This smooth, premium light-medium roast instant coffee takes its delightfully fruity taste from 100% Arabica beans from Colombia, benefiting from the tropical high altitude of the Huila region. Savour every sip of a delicious instant coffee with a truly delicate intensity.